Your Secure Storage Facility in Dawson Creek! Ace High Storage provides storage for all your belongings and valuables in Dawson Creek BC. We offer a large selection of storage containers, including sea cans! 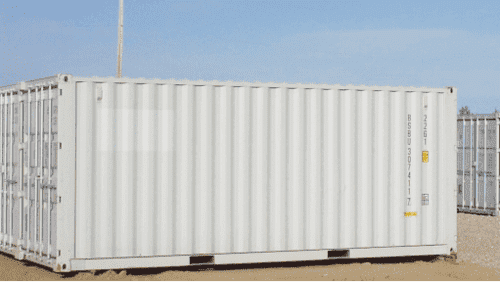 Sea Transport Containers offer a great combination of features for those worried about the security and size of their storage. If you need an almost impenetrable, secure long term storage option for your home or business, Ace High can help! Not all of the estimated 6 million sea shipping containers around the world are on ships! Some of them provide quality, secure storage to our clients right on our grounds. From a storage standpoint, these containers provide many features that make them attractive to long term use. Providing at least 33 cubed metres of storage space means you can fit a lot of your valuables inside! The containers are entirely closed, minimizing environmental impact on your belongings. Sea Containers lend themselves to many storage situations. If you have a retail business, you might need a place to securely store your inventory offsite. Health care industries can keep their sensitive materials somewhere that is sheltered from the elements. Mechanics and other automotive repair businesses are able to store tools, tires or other products in a secure, accessible yet closed environment. No matter what type of business you run, or how many boxes you need to find a place to store, Ace High Storage in Dawson Creek BC has everything you need! We have only had good things to say about your storage facility. Snow removal has been great and you are always keeping on top of security issues. We had zero rodent issues in our trailer. Would highly recommend your business! Kirsten Homme"We have only had good things to say about your storage facility"